Reviews Contents Sample Columns Buy it! 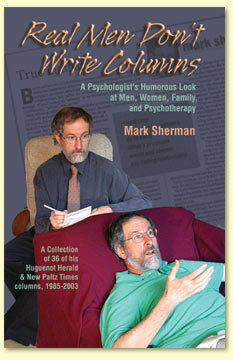 From the more than 460 humorous columns he has published over the last 20 years, Mark Sherman - husband, father, psychologist, songwriter, teacher, and obsessive-compulsive neurotic - has selected 36 on the ever-timely topics of men, women, family, and psychotherapy. Sherman doesn't shy away from looking at his own childhood addiction to spinning around ("Okay, today I can admit it: I had a spinning problem.") and even answers the age-old question of how any woman could possibly find a drifter more exciting to be with than a college professor. "I have just renewed my yearly subscription to The Herald again, and a big reason why is your superbly written column." "I read your article, "To Love, Honor and Squabble" this morning in The Bakery and I found myself laughing out loud. As a writer, you let us peek at our troubles, but you allow us the wonderful place where we aren't able to take ourselves too seriously. Keep writing."